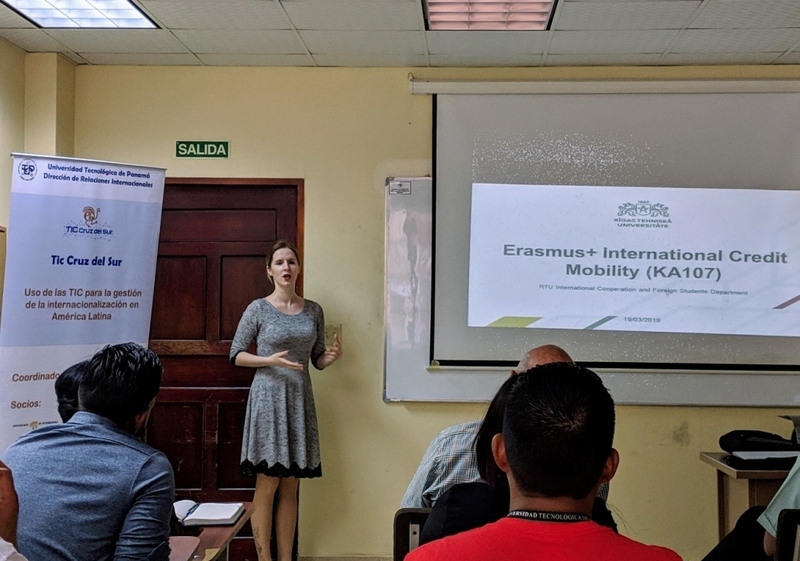 RTU ICFSD International projects unit is successfully continuing participation in Erasmus+ KA2 Capacity Building in Higher Education project entitled TIC CRUZ DEL SUR “Use of ICT for integral management of internationalization in Latin America”. During a period of five days (18.03.2019. – 22.03.2019) TICRUZ “Use of ICT for integral management of internationalization in Latin America” consortium members from RTU and Technological University of Panama (UTP) and Universidad Autónoma de Chiriquí (UNACHI) met for a working session in Panama, City of Panama hosted by UTP. During the meeting the RTU, represented by a team of three people within the capacity of TICRUZ project quality management, discussed the project development progress and learned about the requirements of UTP, UNACHI and other participating universities in Latin America’s for the functionality of the IT tool currently being developed. The RTU team also met with applicants for the Erasmus+ KA107 mobility to interview possible scholarship holders. The mobility is set to be implemented at RTU until July 2019. In addition to the scheduled working sessions, RTU team members held a well-received seminar on curriculum internationalization and organized a workshop for administrative and teaching staff about Erasmus+ international credit mobility (KA107). Within the workshop the participants prepared various mobility project proposals for UTP outlining the applicant selection requirements, the aims for the mobility and main thematic areas of cooperation. The key objective of the TICRUZ consortium is to enhance capacity for international cooperation between universities in Latin America’s least developed regions and HEIs in EU countries, by facilitating transfer of knowledge and best practice in transparency and credit recognition. Furthermore, it aims at promoting the exchange of knowhow and good practices among the partnership HEIs, thus creating IT’s tools in the management of mobility programmes as a part of a future internationalization strategy that may positively contribute to their development. This project will capitalize on the strengths of existing partnership, Erasmus Mundus CRUZ DEL SUR. It consists of 10 full member HEIs, targeting a total of 6 countries, 3 in Latin America: Honduras, Panama and Argentina; and 3 in Europe: Spain, Latvia and Portugal.